This is a SIZE SMALL and my measurements are 35-26-35 BUT the lace fabric stretches and conforms to many body shapes and sizes. Therefore it could also fit someone slightly smaller or larger! This dress is absolutely beautiful! I am selling this dress in pristine condition only because I decided to elope and went with a different style of dress. 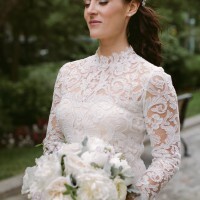 This is the most flattering and comfortable wedding dress and is absolutely perfect for the bohemian bride-to-be or an outdoor/country wedding venue! This off the shoulder bohemian wedding gown is made with a floral cotton polyester blend lace and fully lined with a matte stretch satin. Armbands are designed with an elastic band for comfortable wear also leaving the option to be worn on the shoulder or off the shoulder. A hidden ivory back zipper and clasp are added for ease of dressing. This ivory lace gown is designed with a fitted bodice to accentuate the waist and a free-flowing A-line skirt that sweeps into a subtle train enhanced with a scalloped trim. The dress does run small in length. I am 5 ft 5" tall and the dress hangs past my feet when I am barefoot or in flats and hits the floor with kitten heels. With higher shoes the dress does have a hi-lo effect to the hemline which works well if you really want to wear a higher heel. This has NO alterations and the train has been left untouched (therefore you can decide on whether to add a bustle or not!). There are NO rips, tears or stains on the lace and is in brand new condition! Once you send a message, Leanne can invite you to purchase the dress.